In recent decades, demographic changes have transformed school districts in North Texas. Schools have also transformed the way they teach English – by teaching Spanish, too. At Bowie Elementary in Grand Prairie, Spanish-speaking kids are learning both languages as early as pre-kindergarten. One morning, Teresa Martin’s kindergarten students gather on the carpet for storytime. She reads a book in Spanish about Thanksgiving. She stops and asks a question. When I read, what’s the objective? A girl, Brianna, raises her hand. Martin calls on her. We’re supposed to listen to you read so we can ask each other questions about the story, Brianna says. Martin tells her students to form small groups and talk about the book. The kids pair up and do just that – in Spanish. The goal is to get these Spanish-speaking kids to learn English. But to speak English well, you need to master Spanish first, educators say. At Bowie Elementary in Grand Prairie and beyond, schools have been turning to what’s called dual language classes. At Bowie, the classes are popular: Half the students are what’s known as English language learners. Martin wants her kids to speak both Spanish and English. Reaching them in kindergarten is critical, she says, because learning two languages works best when you’re very young. “Those kids that do come in strong fluently, that pick up the Spanish – they can write it, speak it and read it phonetically – the English comes in a little bit easier,” she says. 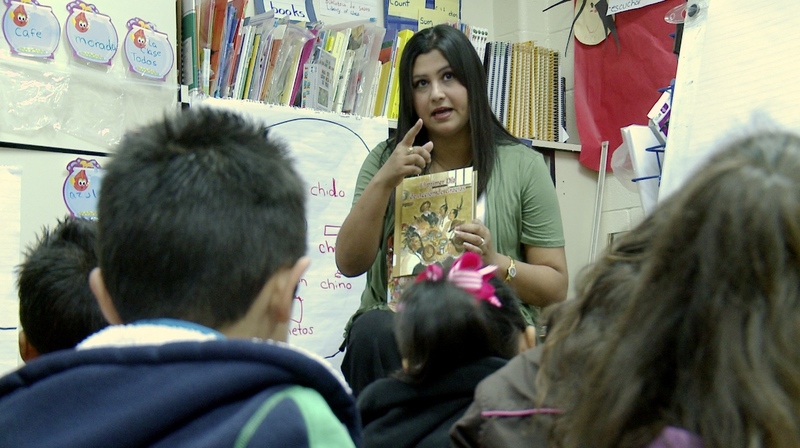 Grand Prairie has been taking this dual language approach for nearly a decade. Here’s how it works: students in pre-kindergarten through first grade are taught language arts in Spanish. Beginning in second grade, they’re taught in both languages. Math is always taught in English, while science is always in Spanish, regardless of the grade. Outside of those classes, there’s the language of the day. On Monday, Wednesday and Friday, it’s Spanish. On Tuesday and Thursday, it’s English. Kids and teachers use the designated language in the hallway, on the playground during recess, in the library or computer lab. That can be a challenge. Some kids have trouble at first. Martin says that’s because they don’t have the foundation at home to speak English since most of their parents only speak one language. 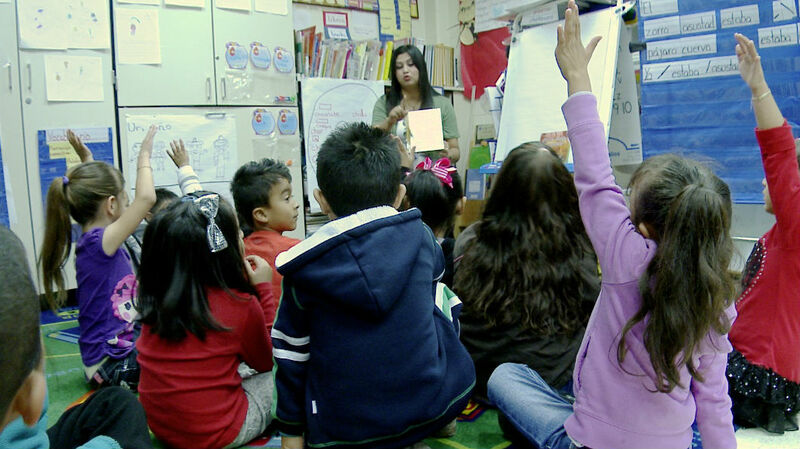 Yet most of the Grand Prairie district’s English language learners were born in the United States. Martin encourages them to speak English. We are giving these kids something that can never be taken away from them. We’re building a foundation for their life. That’s where the buddy system comes in. Each kid is paired with a classmate who’s stronger in the other language. Look at a chart on the wall – blue is for the best English speakers. Red is for Spanish. Martin says kids are usually less shy about speaking English when they’re practicing together. And that’s where the fun comes in. The kids sing words and practice the sounds that different letters make. Five-year-old Dania Villatoro, one of Martin’s students, says she likes her class. Her favorite book: a story about princesses. Dania doesn’t just want to learn English. She wants to learn a lot of English. She wants to understand what others are saying. Bilingual education has changed dramatically, says Delisse Hardy, the principal at Bowie Elementary. A couple of decades ago, it was more of a transitional program to get kids to learn English as quickly as possible. Alicia Salinas oversees the Grand Prairie district’s dual language efforts. She says they’re working. 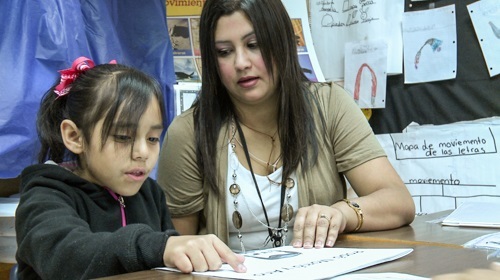 Two years ago, English language learners in Grand Prairie had higher passing rates on STAAR tests in reading writing, math and science than their counterparts statewide. English language learners don’t have to sacrifice their Spanish skills, says Alicia Salinas with Grand Prairie ISD. “Not only are our English language learners doing better in English in regards to academics – talking, reading, everything else – but they didn’t have to sacrifice losing their Spanish,” Salinas said. Learning the building blocks of one language makes it easier to learn the basics of another. Rossana Boyd, principal lecturer of teacher education and administration at the University of North Texas, says speaking two languages can help people process information more quickly, stimulate brain growth and even delay the onset of Alzheimer’s disease. While younger kids may struggle with English, you can see the progress the older kids are making in a fourth-grade math class at Bowie Elementary. Teacher Maria Mercado asks her students some questions. “The income?” a kid says. As Mercado explains, her students aren’t just learning how to solve math problems. They’re building vocabularies in Spanish — and English.